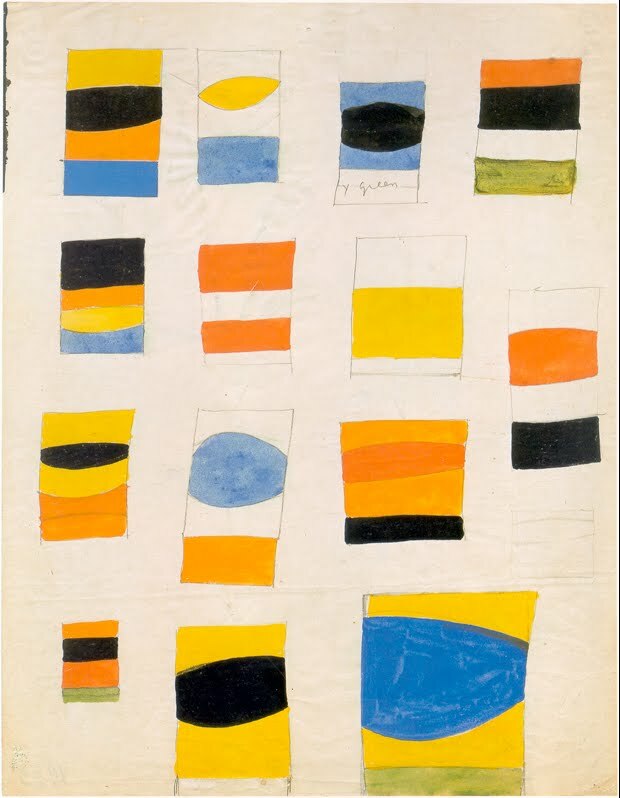 Ellsworth Kelly's exhibition of drawings at the Hugh Lane Dublin City Gallery has opened. Now aged 87, American artist Ellsworth Kelly is working as hard as ever. In this article in the Irish Times he talks to Belinda McKeon about sticking with his own vision in a career spanning six decades. Giant? Invention of form, complex colour relationships, diverse composition, management of scale, poetry, self subversion and personal revelation all done with apparent freedom, humility ( I don't know the man!) and courage. Giant. Ellsworth Kelly. Fourteen projects 1965. Ink, Pencil and gouache. 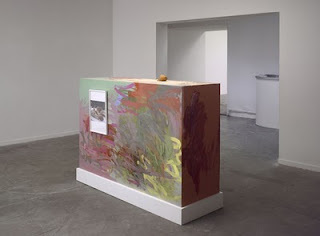 However, this show at the Walker is attempting to define something new: 'Now-legendary figures as well as younger artists who have revolted against the aesthetic orthodoxies of their times are featured in the Walker Art Center exhibition Abstract Resistance on view February 27–May 23. Nearly 40 works ranging from the 1950s to a brand-new commission do not conform to a single theme, but are united in challenging what is expected of art, from the way it looks to the role it plays in society at large. In my view this exhibtions limitations are that they have only drawn from works existing in their collection, however, this in itself is impressive. 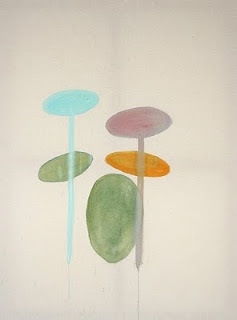 But also they have a broad remit that includes photography, sculpture/installation as well as painting. 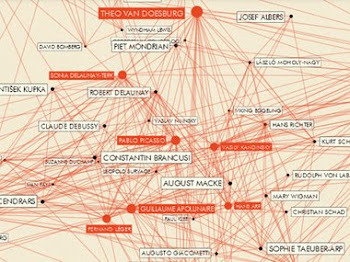 It is also a diverse grouping of artists, both those that have a historic resonance and significant contemporary artists. 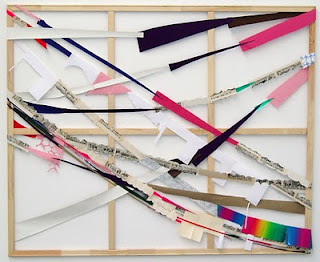 Perhaps it is seeking not only to define art that has been made recently, but to suggest other ways to view abstract art in a much wider context. It is here that I believe a way forward can be constructed, a new framework built upon. More than anything, the curators have sought to not focus and dwell upon the movements, ideologies and theories that the artists emerged from in their early careers and became known for, but to redefine what the works can mean. Let me know what you think? As you may know from previous posts I am a fan of Richard Feynman - physicist. Murray Gell Mann was a contemporary and colleague of Feynman. They were interested in the investigation of the quantum world but had disagreements that fueled their enquiries. A similar relationship, I suggest, to that of Mondrian and Van Doesburg. Scientists frequently are confronted by aesthetic judgments that emerge quite naturally from having to use their imaginations. They are curious about creation, certainly creative and have observations about creativity from their experience and scrutiny of the world. David Bohm another giant in the physics world wrote Science, Order and Creativity (Too many points within it to cover here but very readable and worthwhile.) However back to Gell Mann - he talks about elegance and beauty being signifiers of truth and within this symmetry and simplicity as indicators of beauty. He acknowledges the difficulty of imaginative conceits and the possibility of self-deception by referring to the manner by which Newton hid his idea of gravity just in case his contemporaries considered it in this vain light. He knew the impact of his idea was to be so huge not only on the perceptions of the universe but on his colleagues and institutions. This example raises the question how do you recognize beauty? If you think you recognize it are you certain of it? What is truth? Etc etc....... Which brings me to Murray Gell Mann's equation, which can no doubt be applied to many activities but rings true to me with regard to painting. The Staatliche Kunstalle Baden-Baden has a show of the painter Stefan Müller. These works explore the current trend in contemporary painting in dismantling minimalism and creating a lighter aesthetic quality to the work. This painting nods happily to Ken Noland, (see earlier Obituary post) and yet suggesting a way forward. 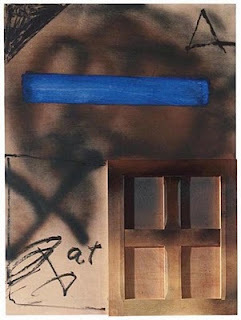 A number of Müller's works have this lightness to them, some work better than others, as always.. I believe we are seeing the signs of an unravelling of the old 20th Century dogmatic approach to theory, especially in painting, these ideals somehow don't fit for the open, global, cross cultural/cross-disciplinary world of the new century. Anyone else feel this way? On Thursday 18 March an exhibition opened at A arte Studio Invernizzi featuring sixteen large-format works by Mario Nigro from the Spazio totale (Total Space) cycle of the 1960s and the Ritratti (Portraits) and Dipinti satanici (Satanic Paintings) series of the late 1980s. This is the first time these works have been displayed together in a private exhibition space. 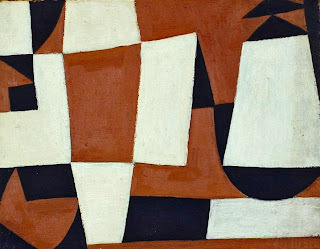 Mario Nigro (b. Pistoia 1917, d. Livorno 1992) was, in the post-war period, a leading exponent not only of Italian art but also of abstract art at an international level. As a result of his background in science (he graduated from the University of Pisa firstly in chemistry, then in pharmacy) and music (he played the violin and piano), he developed an artistic style that, although it was based on a totally abstract formal structure determined by the principles of musical rhythm, such as repetition and variation. The rhythmic structures forming the basis of Nigro’s work are surfaces, lines, grids, and series of signs and colours that are added and subtracted in vigorous, musical harmony. 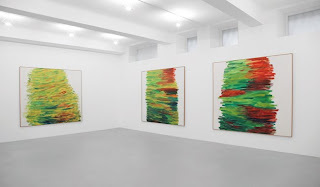 I was curious as to the origin of the titles 'Satanic Paintings' and can only surmise - I couldn't find any information on the matter - that it is the painterly quality of these paintings in contrast to the 'pure' 'clean' abstraction that he is mostly known for! The A arte Studio Invernizzi has a deliberate policy of curating Italian artists with foriegners alternately in order to examine the work in light of each other and establish dialogues. With Mario Nigro taking me to Italy I was reminded of a fantastic visit in Citta di Castello to the Fondazione Palazzo Albizzini Collezione Burri. The collection and how it is housed is a heartening act of intent from Citta di Castello. having been saturated with Giottos, Piero della Francescas and other fantastic renaissance works, finding the Burri Foundation was like finding an ocean. I wasn't in need of an oasis but the works and setting in contrast, scale, ideas and temperature suggested other horizons. The pictures show two aisles of which there are many. I have translated the text from the Pflazgalerie website using online translation so there are a few curiosities ( Gentleman- race work! ) but for those of us that don't read German hopefully it will be more accessible than linking to the website. Or alternatively you can visit the Ikon site and read the text for the exhibition they held last year. The museum Pfalzgalerie Kaiserslautern shows the first retrospective of the work of the American artist Carmen Herrera with this exhibition - to be presented altogether 55 work from the period between 1948 and 2007 - in Europe, organized in co-operation with the Ikon Gallery in Birmingham, England. 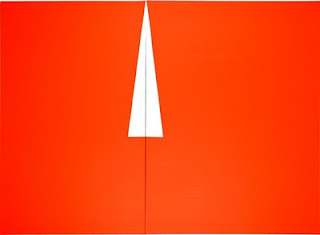 Despite its contacts to well-known and influential artists and the outstanding quality of their work Carmen Herrera issued relatively rarely. By this extensive exhibition you experience so far too little well-known work the being entitled attention. Sculpture Carmen Herrera venetian talk, White and black, 1949 The artist is born 1915 in Havanna, Cuba, and lives since 1954 in New York. After a study of architecture to the Universidad de La Habana it received its artistic training 1943-1947 at the kind Students League in New York. To their there circle of friends bar-nicely Newman and Wifredo Lam belonged. 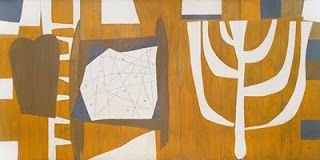 A longer stay in Paris from 1948 to 1953 brought the stylistic development of its work of gestischen abstraction to the French postwar art to stringenter formal attitude. 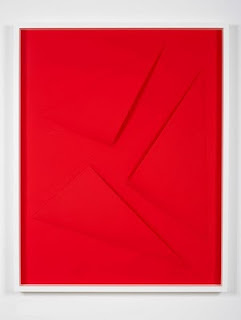 From 1954 to again in New York, Carmen Herrera created an outstanding concrete work, which is consistently dedicated to the ungegenständlichen art over a half century. 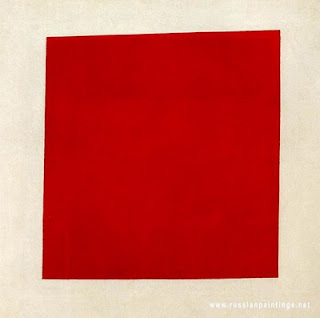 It concentrates for the early 1950er years on pure geometry - line, color, surface are the formal elements, whose autonomy justifies its own aesthetic reality. 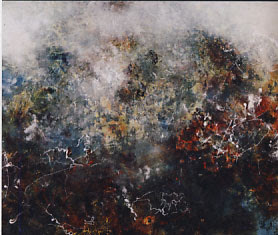 Their works are the result of harmony and tension of opposite color surfaces, which give aliveness to the surface. With reduced means negative-positive forms and optical rhythm are obtained by large complexity. Gentleman-race work of the 50's reaches often in surprising way already the artistic developments of the 60's into the range that minimum kind and the hard Edge ahead. Sculpture Carmen Herrera Amarillo, 1971 The project adds itself into a set of exhibitions of the museum Pfalzgalerie, which was dedicated to American artists, mainly the abstract expressionism. Carmen gentleman-race work opens the view of those in this country for few admitted non-European variants of concrete-constructional art, here in particular on the Latin American contribution. To the exhibition a catalog is published published Buhlmann, Jonathan Watkins, Carmen Juliá and Juan Ledezma, from Nigel Prince, with numerous illustrations as well as texts of Britta E. extent 84 sides, price 30 euros, ISBN 978-1-904864-54-7. 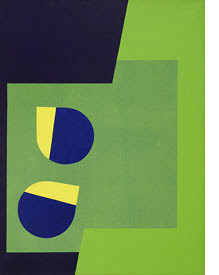 Max Wigram's new premises opens in Bond Street with a Marine Hugonnier exhibition of works on paper, proving that Suprematism, now nearly 100 years old, and the influence of Ellsworth kelly and Minimalism, about 50 years old, are still strong in the 21st Century, but after such a long time, for how much longer?.. 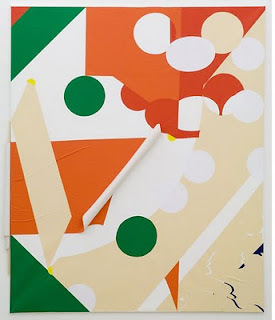 A new kid's in town and with a playful approach to abstraction. In his first exhibition on London, this show is worth seeing. The German artist Henning Bohl is at the Cubitt Gallery. 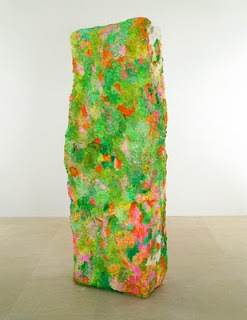 Henning Bohl was born in Oldenburg in 1975 and studied at Kunsthochschule Kassel and the Städelschule in Frankfurt. His recent projects include solo exhibitions at Kunsthalle Baden Baden, Oldenburger Kunstverein, Johann König, Berlin and Casey Kaplan Gallery, New York. (see more images of his work in New York at Casey Kaplan here. Bohl lives and works in Berlin. Wow the Americans believe and commit. 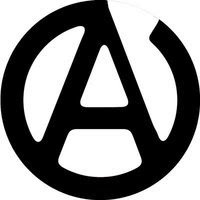 A general observation perhaps but it can be seen from the activity in the United States that abstraction is not only breathing it is running. And it would seem that there are cheerleaders from all sectors waving flags and cheering it on. I am envious of how integral it seems to be and of the corporate support it attracts. 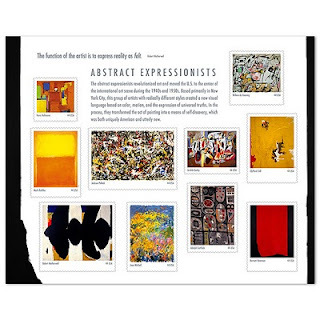 The US Postal Service has released a set of stamps that celebrates Abstract Expressionism. A miniature exhibition in 44c stamps has been curated by Ethel Kessler and historian Jonathan Fineberg. Each stamp includes the artist’s name and verso text that identifies the painting and briefly tells something about the artist. It is interesting that Franz Kline is missing from the set, who according to The Times top 200 most popular artists is more valued than Robert Motherwell. ( Surprisingly Van Gogh didn't appear anywhere in the list.) 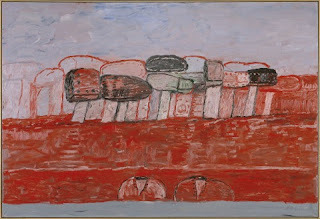 I personally would have liked them to have included Philip Guston in the collection of stamps but perhaps his later works excluded him. Still despite these omissions this is a delightful set of stamps. 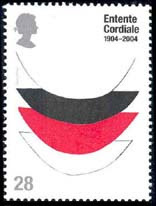 In a more modest way the British have in the past used abstract painters as in this example using Terry Frost to promote Entente Cordiale. If Tapies can be categorised as a 'Fiddling Rustic' I will eat Joseph Beuys's hat. If he is considered an 'Old Jazzer' I'll eat George Melly's hat. 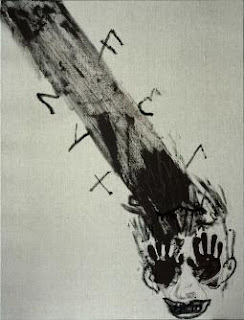 The Fundació Antoni Tàpies will reopen with Antoni Tàpies. 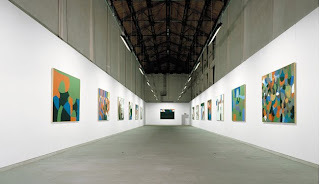 The Places of Art, an exhibition that includes works realised by the artist in the last twenty years (to coincide with the two decades of existence of the Fundació), and a selection of earlier works acting as counterpoints (namely works from the mid-forties) that can be seen as the seeds for his later production. 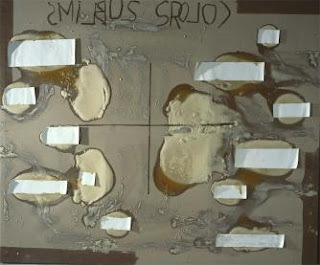 The exhibition will also include a selection of works from the artist’s private collection, a fragment of what he himself has named his ‘manifesto’ and his ‘museum’ [Antoni Tàpies, El arte y sus lugares (The Places of Art), Madrid: Siruela, 1999]. This selection includes works ranging from Egyptian art to modern Western art, from ritual objects to scientific books, which are not only the habitat of the artist but are also linked to his particular way of conceiving art, and represent a heterodox questioning of its origins, history and meaning. 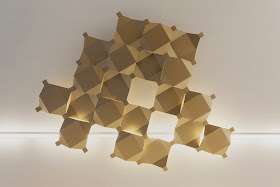 The selection brings together pieces that have rarely, if ever, been seen in an exhibition space. " 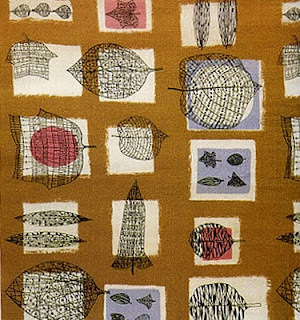 Motherwell's curtain reminds me of Lucienne Day's fabrics. An influential British designer who died on the 30th January this year aged 93. She was born 19 days before Motherwell. 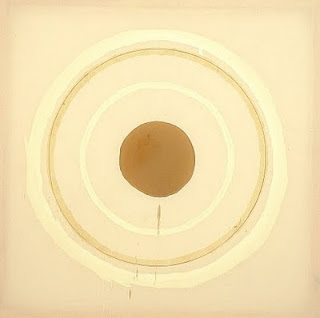 Lucienne's work came to the fore in 1951 and Motherwell had already found his furrow in the early 1940's but.......but Lucienne's work was widely distributed in 1951 because of the Festival of Britain the same year as the Millburn commission. Pah.